Space is limited. RSVP to Aventura Turnberry Jewish Center at 305.937.1880 or to LKafka@atjc.org. Join us for an intimate portrait of the life of artist Irene Lieblich who lived through the horrors of the Holocaust and went on to become a world-renowned shtetl painter and illustrator of Nobel laureate Isaac Bashevis Singer's stories for children. What distinguishes Irene's journey? It is the inspiring story of a female survivor who not only triumphed over the Nazi's but who also was determined to take on the male-dominated world of New York's art scene in the 1970s, and skyrocketed to recognition. Through a series of remarkable events, she eventually came in contact with Singer. With visual presentations, this journey is told through the eyes of Irene's daughter, Mahli, and focuses on the mutual belief shared by Singer and Lieblich in fate and the forces that frolic within us. On Sunday, March 10 at 10:00 AM , the Jewish Genealogical Society of Greater Miami is hosting Bennett Greenspan, President and CEO of Family Tree DNA on the FIU Campus FIU Graham Student Center 11200 SW 8th Street, Miami, FL, 33174 . Did you ever wonder about your own DNA and Jewish Ancestry? Now is your time to ask all the questions? Join us . Entrance is No Charge ! Aventura Turnberry Jewish Center is proud to participate in the 5th International Shalshelet Music Festival. ##Share Shabbat with us on February 15th: Friday Night Live services followed by a traditional catered Shabbat dinner. Guest composers will join our clergy to share sacred Jewish music with our guests during dinner. Email lkafka@atjc.org to RSVP for dinner. $36 per adult, $20 per child under 13. Megillah Celebration, Saturday, February 23, 6:15 pm. Theme will be Neverland Purim. Come see Purim show. Hear how Mordechai (Peter Pan) and Esther (Wendy) saved the Jewish people from Haman (Capt. Hook). Then enjoy Queen Esther's ice cream blast. Come in costume! Traditional Megillah reading will be at 7:45 pm in the Perez Chapel. Beth Torah Benny Rok Campus, 20350 NE 26 Ave., N Miami Beach. 305-932-2829. Unlimited rides and games. $15 in advance, $20 day of Carnival. Food available. Wednesday, February 20, 3:00 pm to 6:00 pm. 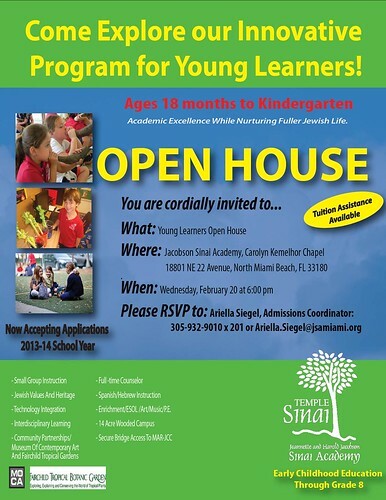 Beth Torah Benny Rok Campus, 20350 NE 26 Ave., N Miami Beach, for info 305-932-2829. Navigating an Emotional Minefield with Your Aging Parents? Find Out How to Do It Right Next Tuesday! Tuesday, February 19th at 7 p.m. Please Join Jewish Community Services for a presentation designed for members of the ‘Sandwich Generation’ facing issues with aging parents. Adult children must naviagate an emotional minefield when helping aging parents. Learn how to deal with issues such as: • Intervening in parents’ finances • Helping them surrender their driver’s license • Deciding when personal care at home is needed -- And how to take care of yourself in the process! Seating is limited so contact Marli Lutz at mlutz@jcsfl.org or 786.282.4707 today! Multi-Lingual Slinging Hip Hop Artist Y-Love Brings Culturally Diverse Blend Of Rhyme To Miami. Y-Love is a Los Angeles-based African-American Jewish gay hip-hop artist. An Orthodox Jew, Y-Love was formerly Hassidic. He rhymes in a mixture of English, Hebrew, Yiddish, Arabic, Latin and Aramaic, often covering social, political and religious themes. Guava Rugelach Lounge programs are presented under the palms in our outdoor lounge setting. Refreshments always available including our Guava Rugelach cocktail featuring L'Chaim Vodka and the best guava rugelach pastries you'll ever taste! Tickets are $25 general admission, $20 for students, seniors and artists, and may be purchased at www.brownpapertickets.com or 800-838-3006. In addition to the performance, Y-Love will also be featured on a panel about Jews in Hip Hop along with Miami Hip Hop artist Brimstone and others on Thursday, February 14 at 7pm at Next@19th. Please RSVP to Roz@nextat19th.org or 305-642-7732. Residents of Palm Garden of Aventura are truly in need of visitors. Volunteers are needed to spend time with seniors; reading to them, singing with them, praying with them or just having a warm conversation. Volunteers are needed all days and at all times. A personalized schedule can be created for you. If you play an instrument, sing, or have any other special talent to share please consider this volunteer opportunity. Palm Garden of Aventura is located at 21251 E Dixie Hwy. If you are interested in bringing cheer to the residents at Palm Garden of Aventura please contact Laura Guren Rodriguez, Director of the Jewish Volunteer Center at 786-866-8680 or volunteer@Jewishmiami.org. Thank you for volunteering!